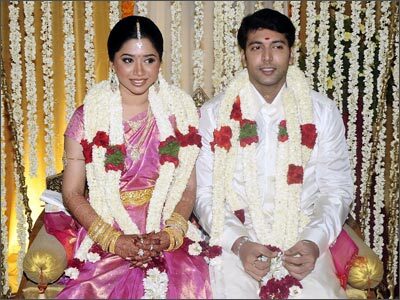 Jayam Ravi, one of the most successful and promising young actors in Tamil got married to Aarthi on June 4 at Hotel Park Sheraton in Chennai. The actor burst into the Tamil scene with Jayam followed by many hits soon after. The young actor tied the knot at 8:46 in the morning. Jayam Ravi was in the traditional south Indian dhoti and silk shirt while the bride wore a gold coloured sari. 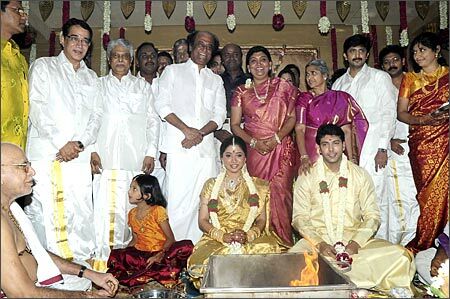 Tamil super star Rajnikanth was there early to bless the couple. Kamal Haasan also turned up to wish the newlyweds.